Shane Smith, co-founder and CEO of Vice, recently made headlines with his prediction of a “bloodbath” in digital media. 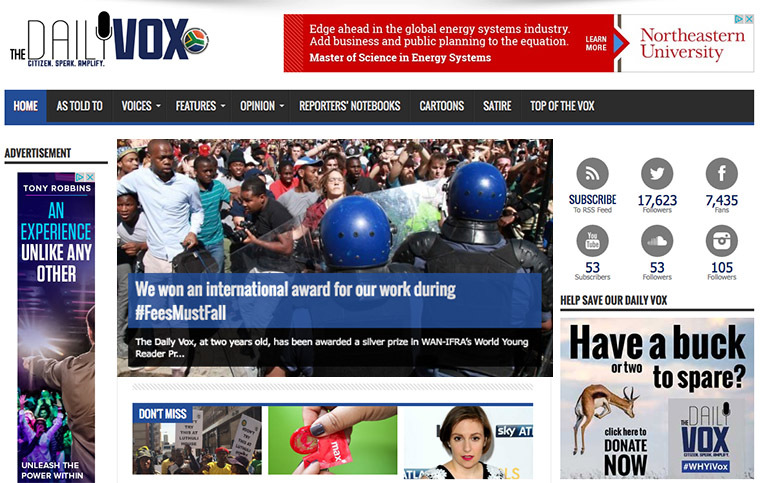 In South Africa, the recent #feesmustfall campaign has not only highlighted education policy, but also the role to be played by media up-starts such as the crowdfunded Daily Vox of Johannesburg. Excellent stuff. Handing the keys to the kids — the ones unencumbered by journalistic training — and freeing them from the legacy of print is admirable and a bold acknowledgement that new audiences want new ways of storytelling. But if you’re from existing media, the act of handing over the keys could end up as a write-off. This is not the write-off you are thinking. The kids aren’t necessarily going to crash the vehicle. Indeed, the future is probably bright for new sections and media being piloted by non-journalists. No. The valuable asset being written off in these bold ventures is the skill and experience of your existing staff. We all know the paradox of print media. Print is “dying” — but it still pays the bills. Meanwhile, digital is the future, but only if you can get someone else to fund the present. If you’re the NYT and you can afford to work up two parallel centres of excellence, then great. If you’re a fresh-faced digital fledgling (Daily Vox started on a budget of less than US$1,400), then you don’t have to worry about your print background. If you straddle the two, however, then you could be in for tricky balancing act. For instance, we recently worked with a media house on a round of successful executive workshops on developments in digital, data, and visual journalism. The enthusiasm and motivation was dampened somewhat when the editor-in-chief of the “paper side” made it entirely clear that he had no intention of changing an iota of his procedure or routine from the previous decades. The question we have to ask is: Does it even makes sense to try to convince the print editorial team to join the future if the editor-in-chief hasn’t bought into change? We think the time is long gone to be having that discussion at that level. However, as a rule of thumb, what we find is in any given organisation, you have around 20% who steadfastly resist change, and maybe 20% who are keen to try it. The other 60% are waiting to see what happens. That 60% probably includes a wealth of finding the right stories, storytelling talent, and finely tuned critical judgement. They can also be very quiet compared to the other groups and are also unlikely to put their hands up to volunteer. This often means they get side-lined in the massive effort to try to convince the minority of editorial staff who refuses to budge. The result is that change processes can seem insurmountable. As a result, decision makers give up and call in the fresh batch of staff to start from scratch. But, what if decision makers worked more with the neutral 60%? Granted, training and coaching the 60% takes time, effort, and money. It’s also guaranteed that some of that effort will be wasted since maybe half of those trained will fail to deliver. But for the half that makes the journey, there is a huge value in the retention of their judgment, experience, and, often, ability to work alongside the kids, mentor them, and create a level of quality that could not be achieved by those with no journalism training or experience. Attitude and aptitude are far more important than skills. Skills can usually be acquired if the attitude and aptitude are there. But, naturally, there is a fine line to tread. For those who resist or who turn out to be lacking in attitude or aptitude, there is no point in wasting effort on dragging them where they don’t want to go. Fresh faces and fresh starts are fine things, but any focus on the young that ignores the potential of the young-at-heart isn’t an act of boldness. It’s not about giving away the keys; it’s about giving up.